Recycling can be used in all areas of our lives. Starting to recycle requires a change of mentality, where humans are not the center of the world. On the contrary, the Earth is the center it is our home and that of thousands of species so all the efforts we make is to preserve the nature and the species that we live in it. Globarket is a company established in San Diego that recognized the need for a waste tire recycling facility in the county of California, we specialize in recycling car and truck tires of all sizes, and however we also serve other industries. We provide excellent service and quality products made from recycled tires. In this post we would like to share with you some of the uses and benefits of using mulch. Bill Mollison and David Holmgren were the creators of permaculture in the 1970s and began to see how they could produce what was necessary to sustain the human species without significantly damaging the environment and created a concept called permaculture. Permaculture is a design of productive areas that is friendly to the environment; the goal is to keep communities or regions that are engaged in farming or livestock. This way, people can recycle nutrients, waste; taking full advantage of the energy. In addition, the goal is to produce the same or more energy that is consumed to make a comprehensive design of human settlements that are productive, sustainable and respect nature. Permaculture finds the relationship between water, wind, sun, energy, plants, land and animals integrating it with humans to integrate designs that are sustainable and productive. The purpose of permaculture is working with nature, not destroying it. Take care of plants and animals as living beings and not only see them as products. We are all equal in this culture and we work together to survive. What does permaculture have to do with Globarket? Globarket spend a big part of its time to make actions that can help reduce that impact to the world, such as diverting waste tires from the landfill to our facility. We as a socially responsible company are concerned about air pollution, waste disposal, water pollution, global warming and other environmental problems that are affecting this planet and a way to remedy it is through permaculture and our contribution is through one of our star products: mulch. One of their main functions is to help retain the heat of the soil allowing a successful crop to stimulate rapid growth by protecting the harvest as it offers a physical barrier between plants and land offering great benefits. Depending on the season, this product has different effects on the soil: it can stabilize the temperature, reduce evaporation (maintains soil moisture) and serves to control pests by preventing unwanted herbs from growing, as well as animals or insects. There is mulching made from natural products such as grass, leaves, straw or wood. The disadvantage of this type is that they rot or degrade quickly so they must be constantly replaced. On the other hand, the rubber mulch (which is made with tires) is important in farming without plowing and is widely used in permaculture. It is recommended to do the mulching when the soil is clean of herbs and to make it of a thickness between 2 and 4 inches (5 and 10 centimeters). Placing a thicker layer can cause excess moisture in the roots and cause them to rot because it does not allow the soil to breathe. Besides using this product in permaculture, is also used for thousands of gardens and recreational areas in the city. 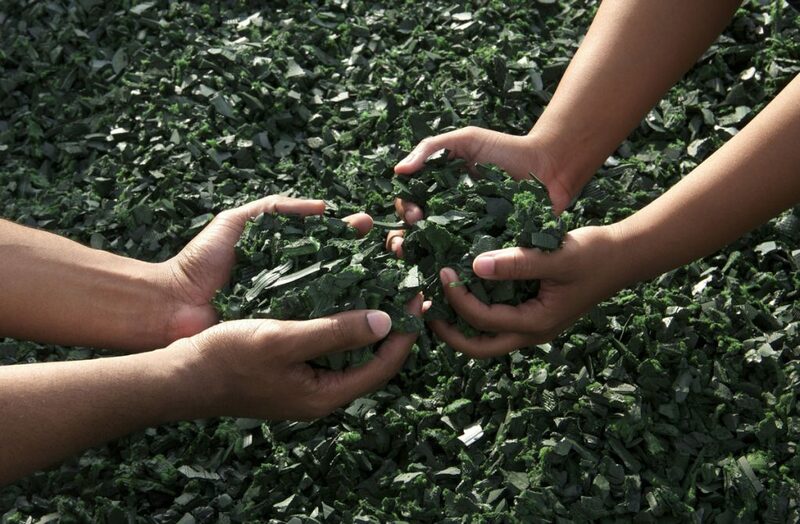 This is why our mission is to provide our customers with the best rubber products for engineering, playground and landscape applications while helping the environment. The mulch in gardens or recreational areas will help to maintain soil moisture, control the herbs, giving at the same time a nice appearance as we sell it in different colors, as well as protection to your plants from insects and changes in temperature. – Used tires for sale; because even the tires we receive are scrap tires we rescue just a few to the used tires market, so we sell a little amount of tires as used. – Tire collection: this is a service of excellent quality and reasonable price, since you can get rid of your tire waste quickly and efficiently with the certainty that our trucks and staff will all work. We offer this service in all California State. – Tire recycling; we have a tire recycling plant that can process scrap tires; you can deliver the tires in our plant with an appointment. Tires waste is a real problem that is affecting our environment. Its manufacture and mass wastes are turning this problem into one that must be addressed urgently. We invite you to know our products, you can browse our page to learn about our services and in the blog you will find information of interest about our industry. Contact us at our email or on our phones, we will be happy to help you.